Is there inertia inherent in the scientific community that is bias in favour of the status quo? When faced with potential paradigm shifts in science, the prevailing dogma has traditionally stood in the path of pioneers. Whether it was epicycles over heliocentricity or heliocentricity over ellipses, there is an innate human tendency to tailor our arguments in favour of the status quo. There is a large support group for the current model always ready to do battle. We invest much time and energy into developing, understanding and teaching others about the 'latest' model, a model that seems so much an improvement over what went before that it cannot be wrong. The things that don't quite fit the model are often dismissed by stronger voices and not necessarily stronger arguments. But arguments are powerful and, like water seeping into what at first may be microscopic cracks in a foundation, given enough time, the cycles of freezing and thawing can topple the most robust of structures. Before Galileo, all of man's observations of the heavens were through the unaided eye. In addition to our sun and moon, which in many cultures were considered gods, man could potentially see 6,000 stars. We were at the centre and the starry heavens circled around us. However, early astronomers who dedicated their lives to observing the night skies could see that although well over 99% of the stars remained stationary relative to each other, there were 5 that did not. It was through studies of this anomalous category of moving 'stars' that set the stage for the discovery of our local planetary system. 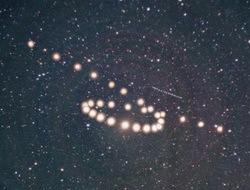 When the paths of these moving stars were plotted carefully, they showed periodic reversals in their trek across the backdrop of stars, a reversal we now call retrograde motion. It was though detailed observations and measurements of the anomalous retrograde motions that led Ptolemy to his elegant model for the motion of the planets.... epicycles and all. But it was only by setting aside Ptolemy's earlier model and starting from a clean slate that allowed Copernicus to develop his grand Heliocentric model with the sun, not the earth, at its centre. The story did not end there, more accurate measurements revealed more anomalies. The plotted courses of the planets did not quite fit the circular paths laid down by Copernicus. It was difficult to shift from the inherent simplicity of circles to another shape. However, through Kepler's careful analysis of the anomalous data collected meticulusly by Tycho Brahe, coupled with his mastery of mathematics, he developed conic geometry that was able to more precisely define the motions of planets as ellipses with the sun located at one of the principle foci. 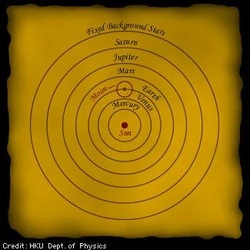 And Kepler's discovery, we all know, laid the groundwork for Newton's stunningly elegant laws of gravity. If history has taught us anything it is that those small pieces of the puzzle, which do not quite fit, lead to paradigm shifts.